Home » Audio/Visual » Cinema » Newbury & Hobbes comes to comics in celebration of its 10th Anniversary! Titan Comics is excited to announce Newbury & Hobbes – a brand-new steampunk adventure from writer George Mann (Dark Souls, Doctor Who, Warhammer 40,000), who brings his successful series of steampunk mystery novels to comics to celebrate its 10th Anniversary in 2018, preceding the stunning release of The Revenant Express next year! The Newbury & Hobbes novel series follows special agents Sir Maurice Newbury and Miss Victoria Hobbes as they traverse the menacing lands of Victorian England, solving extraordinary crimes. In celebration of the 10-year anniversary of the Newbury & Hobbes novels, Titan Comics are publishing installments of a brand-new Newbury & Hobbes prose short story, written by George Mann, in each issue of the new comic series. This new comic series also features the shocking return of Dr. Aubrey Knox – the rogue agent and occultist – who was left for dead in the final pages of The Osiris Ritual, back in 2009. Newbury & Hobbes #1 hits stores September 2018 and features three incredible covers including variant covers by series artist Dan Boultwood (It Came), Chris Wildgoose (Porcelain: A Gothic Fairy Tale, Batgirl) and Arianna Florean (Assassin’s Creed, Star Trek: Spock: Reflections). 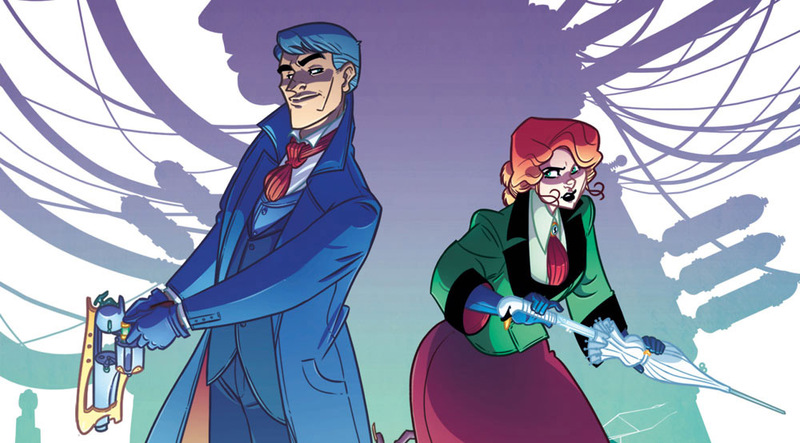 Fans and retailers can order their copies of Newbury & Hobbes #1 from the July edition of Diamond PREVIEWS.